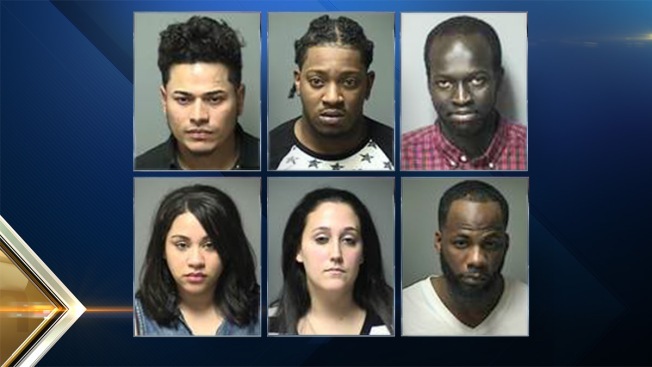 Several patrons were arrested early Saturday morning outside of USA Chicken and Biscuit Restaurant in Manchester, New Hampshire. Several people were acting disorderly, so the manager asked police to remove multiple individuals. Bairon Munoz Benitez, 27, of Manchester was charged with disorderly conduct and resisting arrest. Michael McClain, 26, of Manchester refused to leave the store and ultimately pushed an officer. He was charged with simple assault and resisting arrest. He was released on personal recognizance bail and is scheduled to appear in court on March 29. Peyour Guguai, 25, of Manchester was also charged with disorderly conduct and released on $500 personal recognizance bail. He will also appear in court on March 29. The incident involved many other patrons who were acting disorderly. Multiple officers arrived on the scene to assist with the unruly crowd. Ultimately, three others were arrested. Charlene Rojas, 31, of Manchester was charged with disorderly conduct and released on $500 personal recognizance bail. Tiffany Brea, 24, of Manchester and Benjamin Harris, 26, of Hooksett were both charged with disorderly conduct and resisting arrest. They were each released on $1,000 personal recognizance bail. All three of them will also appear in court on March 29.